Will the California Forest Fires Change Anything? 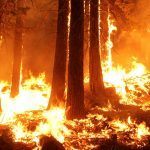 As we’ve all been consumed by the startling wildfires in California, the UA Press’s resident forest fire expert Stephen Pyne has been the man on-call for reporters on the ground. The author of the definitive history of American wildfires and the Press’s To The Last Smoke series, a multivolume series describing the nation’s fire scene region by region, Pyne provides a historical and administrative context for the devastation in California in a recent editorial picked up by Newsweek. Most of California is built to burn: it has fires to match its mountains. Unsurprisingly, fire protection as a formal program came early—a Board of Forestry in 1885; national forests in the 1890s; national parks in the Sierra Nevada under administration by the U.S. Cavalry. In 1905 the U.S. Forest Service assumed control over the national forests and California passed a Forest Protection Act, leading to an ad hoc condominium that fused into a formal alliance with the 1911 Weeks Act. Read Pyne’s full feature in Newsweek.